Do you use an electric toothbrush? If not, what are you waiting for? If you’ve been on fence about switching to an electric toothbrush we’re here to help. Today we’re going to review the top 5 benefits of using an electric toothbrush. We’ve been taught to brush our teeth thoroughly ever since we were little. Despite our best efforts, though, we’re not brushing as thoroughly as we would like—this is due to the fact that the bristles on manual toothbrushes cannot reach to remove all of the plaque and tartar built up between your teeth. Most electronic toothbrushes are set for equal time for each quadrant which ensures a better, longer brushing and a great, clean feeling. Kids are often one of the biggest beneficiaries of electric toothbrushes. Many kids brush but don’t get all of the food buildup between meals. Kids with braces are especially susceptible to this happening. An electric toothbrush is a good compromise since you can count on it getting all of those hard to reach places that kids miss with manual brushing. Old habits die hard. Although we mean well our manual brushing can often be too hard for our gums and our own good. An electric toothbrush not only times your brush (as stated above) but takes the guesswork out of teeth brushing too. An electric toothbrush is an excellent tool in the fight against gingivitis and gum disease in your mouth. How? An electric toothbrush can find those hard to reach places that you miss with a manual toothbrush. You’re not just brushing longer and better but you’re brushing smarter, too. Bad breath is a symptom of food and plaque which have become lodged in the nooks and crannies between your teeth and along your gums. An electric toothbrush and regular flossing can work together to get rid of bad breath by finding and eliminating the food between your teeth. Where can I buy an electric toothbrush? We recommend Philips Sonicare electric toothbrushes here at Blue Back Dental. We have them available for patients, too. 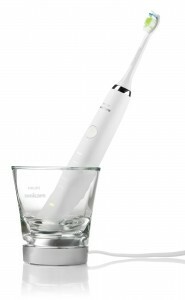 We invite our patients to purchase an adult Sonicare toothbrush at a special price of $85, or $40 off the retail price. We also have the Sonicare for Kids toothbrush for $65, which is also a discount off the retail price. Ask your dentist or dental hygienist if you have any questions. Not a patient at Blue Back Dental? No problem! Schedule a free consultation by filling out the form below or like us on Facebook for more dental tips.